Hand out a fun packed business gift with some real flavour - Company Shape Sweets can be fully tailored to the exact colouring, flavour, size and shape of your choosing. With flavours of Pineapple, Strawberry, Raspberry, Orange and Lemon... Why not have to taste of your Company's branding on the tip of the customer's tongues? Available in 10g / 20g and 50g, there's plenty to go around in a bag, and with a batch of Company Shape Sweets - you can really stand out from the crowd and get your name out and about. 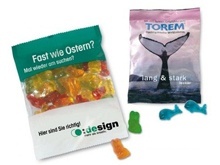 Why not start your advertising campaign with our promotional Company Shape Sweets? For a FREE QUOTE, please fill in the form regarding our Company Shape Sweets and we'll be able to help you.